Although Fredericksburg is quickly becoming known for the art galleries andand the Fredericksburg winery, visitors will find over 150 shops and boutiques. 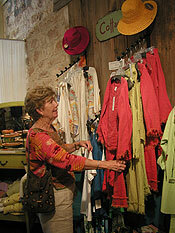 Shopping remains one of the primary reasons visitors come to Fredericksburg. The shops are found on and off Main Street in the seven block area from Elk Street on the east side of town to Edison Street on the west side of town. To find out more about shopping in Fredericksburg call the Visitors Bureau at 800 997-3600 or stop by one of the Visitor Center’s two locations – 302 East Austin Street or the Uptown Visitor Center on the corner of West Main and South Milam Streets.